The girls and I visit an apple orchard each fall. It’s the same one we’ve been going to for many years now. They like the animals that are there, and I like the variety of apples. After we sampled the apples and purchased the kinds we liked, we headed home to make applesauce. I did the first bag of apples, and then Sophia asked if she could peel the apples in the second bag. 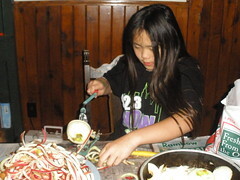 Since she enjoyed doing this, I let her do an entire bag of apples (half the batch of applesauce). Olivia even took a break from her math lesson to peel an apple and grind the applesauce in the Vita-Mix mixer. But, math won out. After doing these two tasks, she went back to addition and subtraction. 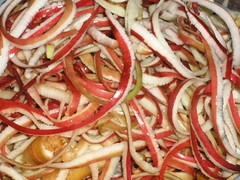 The bowl of apple peels. Made quite a few quarts of applesauce which should last for awhile during the winter and spring. I may do some more applesauce if the price of apples goes down a bit during the next few weeks. Have you got a recipe you like or do you just wing it? I just wing it. Basically, I fill a heavy kettle with apple and about 2-3" of water. On medium heat, I stir the apples until they get soft, making sure that there's enough liquid at the bottom of the pan so the apples don't burn or stick.After the apples are soft, I transfer small batches into the Vita-Mix Mixer and use the variable speed setting (levels 1-3) and grind the apples into smaller pieces. Since both my daughters and I like applesauce with little apple chunks in it, I don't puree the apples. (My mom makes applesauce by using an apple grinder…if that's what's it called…and it literally purees the apples as you turn the handle. )I put the smoother applesauce back into the kettle; and add sugar and Watkins Apple Pie Seasoning until I like the taste of it. I have never measured the sugar or seasoning because apples vary in their sweetness. All the applesauce I make I put in jars and can it so it can be put the shelf and used throughout the winter. If you don't like to or don't know how to can applesauce, you could cool the applesauce and then freeze it.